Former Claret Charlie Austin insists “you ain’t seen nothing yet” from his old pal Danny Ings. Ings scored the winner against QPR on Saturday for his sixth goal of the season, after Austin himself netted his 13th of the campaign to equalise from the spot. Queens Park Rangers' Charlie Austin beats Burnley's Thomas Heaton from the penalty spot during the Barclays Premier League match at Turf Moor, Burnley. PRESS ASSOCIATION Photo. Picture date: Saturday January 10, 2015. See PA story SOCCER Burnley. Photo credit should read: Dave Thompson/PA Wire. RESTRICTIONS: Editorial use only. Maximum 45 images during a match. No video emulation or promotion as 'live'. No use in games, competitions, merchandise, betting or single club/player services. No use with unofficial audio, video, data, fixtures or club/league logos. Austin, despite the result, was delighted for his former teammate, and feels Ings is ready-made to succeed at Premier League level. Ings is attracting a lot of interest, on the back of a 21-goal campaign when he was named Championship Player of the Year, and is out of contract in the summer. Austin said: “I’m happy for Ingsy, we’re good friends, who knows what’s going to happen with him in the next six months, I’m sure the club will try and do what they can for him. “He got injured twice when he came here, which was terrible, and it took time to get into his stride, but last year was not really the best of Dan, to be honest, he was very good, but we all knew that. “In the Premier League he’s kind of suited to it. He’s 22, so he’s only going to get better. There has been speculation that the pair could reunite for England, but Austin played that down: “I can’t talk like that, I’ve got work to do, I just try and work as hard as I can, there’s a lot of players out there, so I can’t look that far ahead. 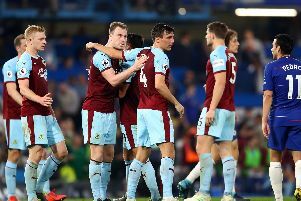 He is the top English goalscorer in the top flight, but a Premier League record 10th-successive away defeat saw QPR slip back into the bottom three, leapfrogged by the Clarets: “It’s nearly 18 months ago now since I moved on, it was probably the best thing for me and for Burnley Football Club, and we both went up. “It was nice to come back, nice to score, but a shame we didn’t get the three points. “It’s going well for me personally but we have to end this block that we’ve got away from home, we need to go again next week and not be too reliant on our home form. “The goals don’t move, so there’s no reason why we can’t. But he hopes both clubs can survive: “Of course, that would be ideal, that’s the aim for both teams, come the end of May, everyone wants to be in the Premier League. “There’s no reason why Burnley can’t do it, with 21 games gone, why not. Both teams look strong.